After Einstein described his theoretical concepts of relativistic kinematics in Part I of his Special Theory, he applied them to certain electromagnetic and optical phenomena in Part II of his Special Theory, entitled the “Electrodynamical Part.” Einstein’s main purposes in Part II were: 1) to attempt to justify and confirm his ad hoc relativistic and mathematical concepts by applying them to so-called experimental data, and 2) to extend his relativistic kinematics to mechanics, electrodynamics, electricity and beyond. In this Chapter 30 and in Chapter 31, we will demonstrate that Einstein did not succeed in this endeavor. A. 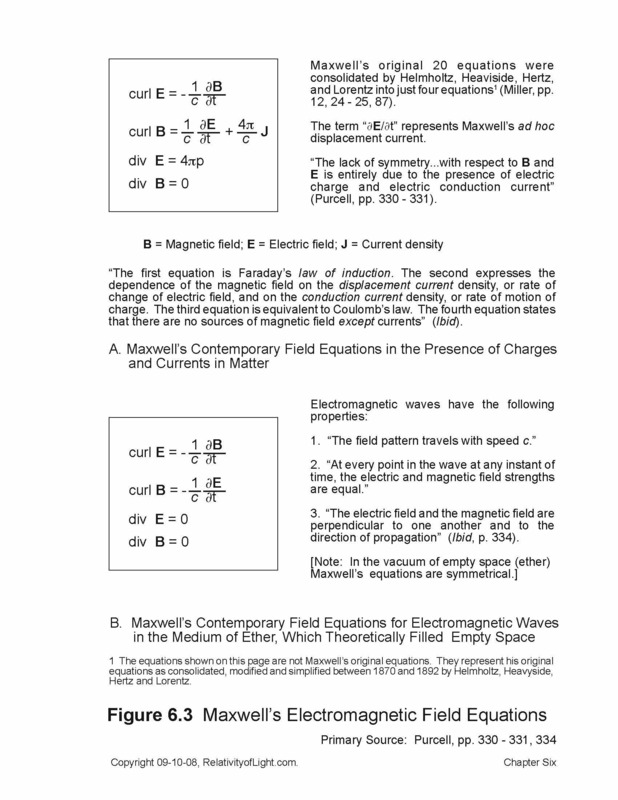 The invariance of Maxwell’s equations for empty space and a description for the induction of an electric current. “§ 6. Transformation of the Maxwell-Hertz Equations for Empty Space. On the Nature of the Electromotive Forces Occurring in a Magnetic Field During Motion” (Einstein, 1905d [Dover, 1952, p. 51]). A threshold question is: Why did Einstein choose Hertz’s 1890 ether reformulation of Maxwell’s equations rather than Lorentz’s 1892 ether reformulation? Most likely the answer is that Hertz’s four Maxwellian equations applied both to Maxwell’s theory of electromagnetism in the presence of charges (i.e. electric currents), as well as to Maxwell’s theory of electromagnetism in the absence of charges (i.e. light and EM radiation); whereas, Lorentz required a separate set of four equations to describe Maxwell’s theory of electrodynamics in the presence of charges (Figure 6.3). Thus, with the Maxwell-Hertz equations Einstein could discuss both the invariance of such equations when applied in empty space (i.e. light and EM radiation) and with respect to the induction of an electrical current. As the title for Section 6 implies, Einstein limited his discussion during the first two pages of Section 6 to the invariance of Maxwell’s “equations of electrodynamics for the case of radiation [i.e. light] in ‘free space’…in the absence of charges” (Miller, p. 270). 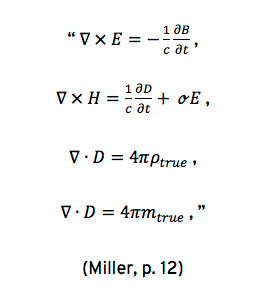 Einstein discussed the invariance of Maxwell’s equations in the presence of electric charges (and electric currents), and the invariance of such electric charges, separately in Section 9 of his Special Theory (Miller, pp. 305 – 307), which we will discuss in Section D of this chapter. Einstein began Section 6 by assuming that “the Maxwell-Hertz equations for empty space hold good for the stationary [inertial] system K…” [Einstein, 1905d [Dover, 1952, p. 51]). In other words, “as in prerelativistic electromagnetic theory, he accepted the exact validity of [Hertz’s version of Maxwell’s] field equations and the constancy of light velocity [at c] in…the resting [inertial] system K” (Miller, p. 271). Einstein then applied the Lorentz transformation equations to the above Maxwell-Hertz equations with respect to inertial reference system k moving with velocity v relative to system K (Einstein, 1905d [Dover, 1952, p. 52]). This process, of course, distorted the Maxwell-Hertz equations in system k (Einstein, 1905d [Dover, 1952, p. 52]). Einstein sidestepped this problem by asserting that such distorted equations were substantially equivalent to the equations in K, except for one algebraic factor and the vectors (Ibid, p. 53). He then reformulated the equations so that the reformulation would apply in both inertial systems (Ibid, pp. 53 – 54). In other words, after all of such algebraic manipulations Einstein’s modified Maxwell-Hertz equations for light were algebraically “covariant” in both inertial frames. “[T]he principle of relativity requires that if the Maxwell-Hertz equations for empty space hold good in system K, they also hold good in system k” (Ibid). In 1905, at the beginning of his Special Theory, Einstein axiomatically described ad hoc his expanded principle of Galileo’s Relativity, which included electrodynamics and optics as well as mechanics. Einstein’s expanded principle of relativity was described as a postulate (an unchallengeable statement which must be accepted on face value). It was asserted without any justification for such radical generalization. The year before, in 1904, Henri Poincaré had asserted a similar generalized “principle of relativity” which also included electrodynamics and optics (Chapter 16B), and Einstein was cleverly attempting to ride on Poincaré’s coattails. However, by 1916, Einstein found it necessary to attempt to justify such generalization of Galileo’s Relativity (Chapter 24). As we have previously demonstrated in detail in Chapters 16B and 24, both Poincaré’s and Einstein’s generalizations of Galileo’s material principle of relativity (Chapter 5) were completely ad hoc, meaningless, and empirically invalid, despite Einstein’s 1916 attempted justification. Because Einstein’s ad hoc principle of relativity had no empirical verification, he had no scientific justification to declare that “if the Maxwell-Hertz equations for empty space hold good in system K, they also hold good in system k.” Einstein needed his expanded postulate of relativity in order to axiomatically make such declaration. He also needed such postulate in order to justify applying transformation equations from one inertial reference frame to another, so that observers in each system could theoretically measure magnitudes of all physical phenomena in the other system. In other words, without an empirically valid expanded principle and postulate of relativity, Einstein had no relativistic Special Theory whatsoever. For all of the above reasons, Einstein could not justifiably apply the principle of relativity and the Lorentz transformations to the Maxwell-Hertz equations. Nevertheless, Einstein did misapply the principle of relativity, he did adopt the Lorentz transformations, and he did misapply them to light and to the Maxwell-Hertz equations for light. Therefore, we must respond to these invalid, irrelevant and unnecessary acts, to Einstein’s bizarre conclusions, and to the resulting mathematical consequences. Guilini points out that this non-mechanical covariance was established before Einstein by Lorentz in 1904, by Poincaré in 1905 and by Voigt in 1887; but “nobody before Einstein connected these results to the principle of relativity” (Guilini, p. 81). The reason for this failure to connect such non-mechanical covariant results to the principle of relativity was (as we have again just explained) that such algebraic electromagnetic results do not apply to Galileo’s mechanics concept of material relativity. The two concepts (Maxwell’s electromagnetic equations for non-material light and Galileo’s mechanics concept of material inertial relativity) are completely incompatible and mutually irrelevant (Chapters 5, 6, 23 and 24). Theoretically, when one applies the Lorentz transformations to anything, a Length Contraction of matter and a Dilation of Time results (Chapters 26 and 28). But Einstein did not mention either of these relativistic mathematical consequences with respect to the covariance of the Maxwell-Hertz equations for empty space. Not to worry, his resourceful followers have taken up the imaginary theoretical slack. 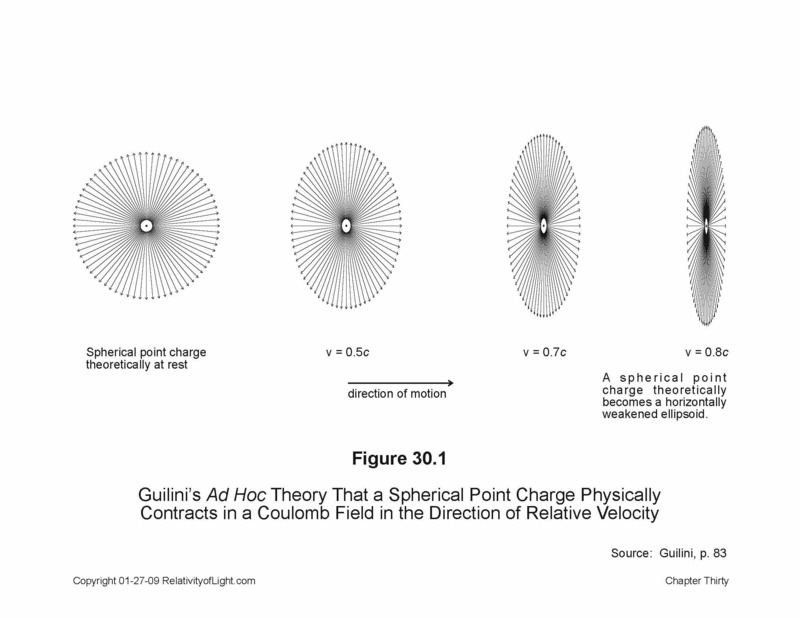 According to Guilini, the Length Contraction manifests itself with respect to the Maxwell-Hertz equations by the spherical point charges in a Coulomb field contracting in the direction of relative velocity so that at v = 0.8c they become horizontally weakened ellipsoids (Figure 30.1). Similarly, the Time Dilation supposedly manifests itself by a reciprocal enhancement (strengthening or elongation) of the point charge’s vertical component which in turn results in a desired variation in the charged particle’s ionization (decay) rate (Guilini, pp. 83 – 85). Aside from such imaginary and dubious conjectures, has either of such relativistic effects ever been detected or observed? Of course not. Toward the end of Section 6 of his Special Theory, Einstein interpreted such covariant Maxwellian equations for empty space (i.e. light) in terms of a moving electrical charge and the principle of relativity. Einstein then determined that the mysterious “electromotive force” that was generally described for the induction of an electric current was none other than an electric force, and “that electric and magnetic forces do not exist independently of” relative motion (Einstein, 1905d [Dover, 1952, pp. 54 – 55]). Did all of the above mathematical theorizing make Maxwell’s transmission velocity of light at c in a vacuum empirically invariant with respect to all linearly moving inertial reference frames? Remember that this was Einstein’s primary goal for his Special Theory (Chapters 18 through 21). The answer is: of course not. 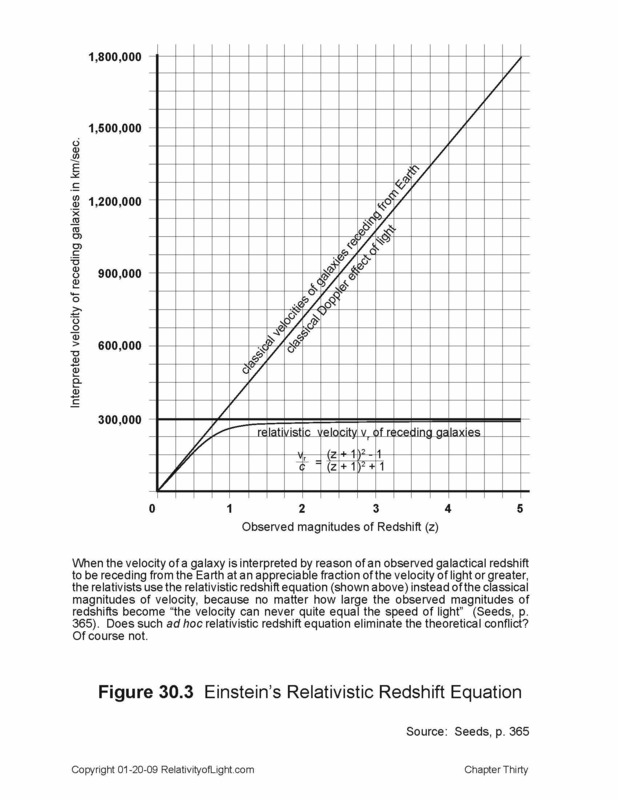 B. Einstein’s relativistic Doppler effect of light. 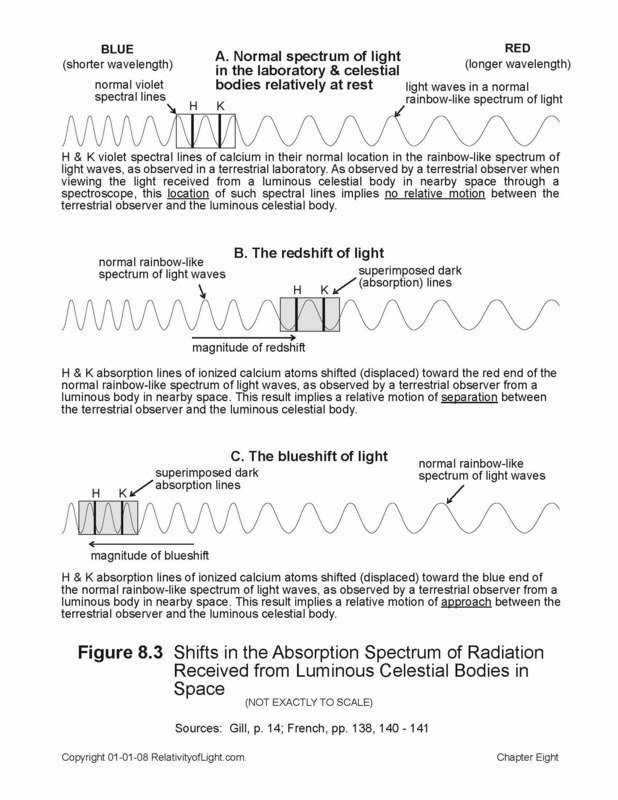 In Chapter 8 we explained the concept of the current classical Doppler effect of light in empty space. 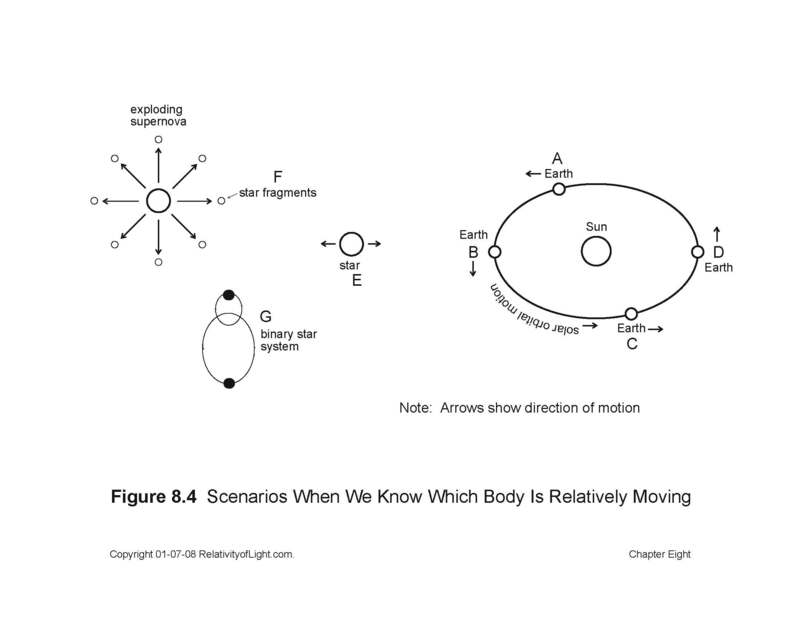 We empirically discovered that as luminous bodies in space approach one another, the light waves emitted by one body are received more frequently by an observer on the other body, and vice-versa. Conversely, as such luminous bodies separate from one another the light waves emitted by one body are received less frequently by an observer on the other body, and vice-versa. These two different phenomena are empirically manifested, when light is received in a spectroscope on Earth, by a red shift of spectral lines for such separation, and by a blue shift of spectral lines for such approach (Figure 8.3). Special Relativity declares that such classical Doppler effect of light is a meaningless concept, because inter alia at one time in the past it incorporated and referred to the fictitious medium of ether (Gill, p. 6). On the contrary, once the fictitious concept of ether is eliminated, the classical Doppler effect of light remains just as valid as Maxwell’s transmission velocity of light at c in a vacuum is without the concept of ether. Nevertheless, in Section 7 of his 1905 Special Theory, Einstein invented an abstract mathematical version of the classical and empirical Doppler effect of light. Why? In order to apply his Lorentz transformations and his kinematic theories to this long accepted optical phenomenon so that it would remain mathematically consistent with his two empirically invalid fundamental postulates and his ad hoc relativistic kinematics; and also so he could claim that the empirical Doppler effect of light was an experimental confirmation of Special Relativity. (Einstein, 1905d [Dover, 1952, p. 56]). The implication from the above scenario is that Einstein’s relativistic formula is able to mathematically predict the empirical Doppler effect of light, and thus all observed Doppler effects of light are experimental confirmations of Special Relativity. “The formula has the required characteristic that it gives opposite frequency changes for approach and recession, and is a function of the relative velocity of the bodies only. But this view of the matter compels us to assume that the observer, and not the source of light, is the moving body. If the source moves and the observer remains at rest, it requires [a different equation]. The two ways of regarding the motion are thus not equivalent, and the postulate of relativity is violated” (Dingle, 1961, p. 24). There are also other problems. Einstein’s relativistic concept, of course, begs the questions: Is there a relative motion between bodies, in which directions are such bodies moving, and what is the magnitude of their relative velocity? For the answer to these questions we must first empirically determine the classical Doppler effect of light by observing the magnitude of blueshifts or redshifts, interpreting their meaning and computing their magnitudes. Do these additional prerequisite requirements not suggest incomplete, conjectured and circular relativistic reasoning on the part of Einstein? Based on Einstein’s Special Theory, Dingle asserted, “[W]e have no basis for assuming any [Doppler] formula at all” (Dingle, 1961, p. 22). “[I]t would be entirely consistent with Einstein’s theory if there were no Doppler effect at all—i.e. if motion had no effect on the observed frequency of light” (Ibid). Nor does Einstein’s Special Theory express any relation between frequency and velocity (Ibid). Again we must turn to observation and the classical Doppler effect of light to supply this necessary connection. The ultimate conclusion is clear: “there is no necessary relation at all between the relativity theory and the Doppler effect” (Dingle, 1961, p. 21). Regardless of all of Einstein’s ad hoc deductions, rationalizations, and transformations, the relativistic Doppler formula cannot be correct because the Lorentz transformations, the other transformations and the relativistic concepts upon which it was based, are all ad hoc and meaningless false assumptions (Chapters 21 through 29). For example, one can see from the denominator of Einstein’s relativistic Doppler equations, as Einstein specifically pointed out in Section 5 of his Special Theory, that the relative velocity between bodies can never mathematically exceed c. On the other hand, this feature of his relativistic Doppler formula posed seemingly insolvable problems and conflicts for Einstein and other relativists during the 1930’s when distant galaxies were interpreted (based upon their gigantic redshifts) to be receding from Earth at several times the velocity of light. These interpretations of gigantic recession velocities of all the galaxies are called “the expanding universe theory” (Figure 30.3). In apparent desperation, Einstein and his followers suggested ad hoc that perhaps the non-material space of the Universe was doing the expanding and that it merely carried the material galaxies along with it (Einstein, Relativity, p. 153). This ridiculous attempted solution to the conflict was referred to as the “expansion of space” theory (Eddington, 1933). Perhaps the most self-contradictory assertion of Einstein’s relativistic Doppler effect of light is its assertion that such relativistic effects are due solely to the relative velocity between two luminous bodies in space. In other words, according to Einstein and his followers, the only thing that is relevant to the relativistic Doppler effect of light is such relative velocity. Einstein denied that there is any meaning to a unique motion or velocity of one luminous body (the source or the observer), or to an identifiable time of such unique motion, when such motions are considered separately. In other words, Einstein and his followers “claimed that all that enters into the picture is the relative motion between source and observer, and to ask which one moves is to ask an unanswerable question” (Gill, p. 14). Dingle agreed with the first part of Gill’s conclusion: “[T]he relativity postulate requires that [Einstein’s relativistic Doppler effect] must not enable us to distinguish in an absolute sense between the motion of the emitter with respect to the receiver and that of the receiver with respect to the emitter” (Dingle, 1961, pp. 21 – 22). French even praised Einstein’s Doppler formula as being a simpler way of expressing the phenomena in that it only depended upon relative motion without any distinction as to which body was doing the moving (French, p. 134). Resnick in turn asserted, “[T]he theory of relativity introduces an intrinsic simplification over the classical interpretation of [the Doppler effect] in that the two separate cases which are different in classical theory, (namely, source at rest—moving observer and observer at rest—moving source) are identical in relativity” (Resnick, 1968, p. 91). In other words, in Special Relativity there is no observational distinction between the two cases. This claim of identity has also been made by many other relativists. For example, “[T]he relativistic result is a kind of unification of the moving-source and moving-observer results…” (French, p. 137). It follows from the above discussion that (in Einstein’s symmetrical relativistic Doppler theory) the relative velocity of the source and the observer produces one and the same effect (either a blue shift or a red shift), and that either the “observation of the movement [motion] is immediate in both cases, or it is delayed in both cases” (Dingle, 1972, p. 216). Which is it? “We know that, with respect to a distant star, the orbital motion of the Earth round the Sun causes an alternation of approach and recession. The Doppler effect corresponding to this is observed to synchronize with the [Earth’s] orbital motion in every case, so we know that, when the [terrestrial] observer moves, the effect is seen immediately…” (Ibid). This empirical fact contradicts Einstein’s assertion that the unique velocity of the observer, when considered separately, has no meaning for the Doppler effect of light. Other empirical facts (such as blue shifts of supernovae and alternating blue and red light shifts of binary stars) also contradict the assertions of the relativists: that the unique velocity of the source body, when considered separately, has no meaning for the Doppler effect of light (Chapter 8C and Figure 8.4). In addition, because our experience tells us that the solar orbital motion of the Earth results in immediate blue shifts and red shifts in the light received by a terrestrial observer from a distant star: “That means that [Einstein’s relativistic Doppler] effect must also be seen immediately [symmetrically] when the star moves, otherwise there would be an observable [non-symmetrical] distinction between the two cases” (Dingle, 1972, p. 216). Therefore, also according to Einstein’s Special Theory, “every Doppler effect observed is a result of a motion occurring at the time (instant) of observation, no matter how far away the source of light may be” (Ibid, p. 217). This fact presents two more extraordinarily serious contradictions for Einstein’s relativistic Doppler theory. First, in Einstein’s relativistic Special Theory, Maxwell’s and Römer’s distance/time delay of the finite light signal at c must be irrelevant to Einstein’s Special Theory, because the light shift caused by a distant motion of the source can be seen immediately (instantaneously) on Earth with no distance/time delay. Secondly, this means that the transmission of information (vis. the blueshift velocity of fragments from a distant exploding star) is instantaneous for the terrestrial observer, and thus such transmission dramatically exceeds the finite velocity of light at c, which Special Relativity claims cannot happen. The above empirical contradictions demonstrate inter alia that the classical Doppler effect of light is correct, and that Einstein’s simplistic, symmetrical and relativistic Doppler theory is invalid. Rather than being an application and confirmation of Einstein’s relativistic concepts, Einstein’s relativistic Doppler effect of light is self contradictory, and it also contradicts the rest of his Special Theory. On the other hand, if the relativistic Doppler effect is correct then information can be instantaneously transferred over great distances (much faster than the velocity of light) which contradicts Special Relativity which asserts that this result cannot happen (Chapter 29). Either way, Einstein’s Special Theory is contradicted. C. The relativistic formula for stellar aberration. (Einstein, 1905d [Dover, 1952, p. 56]). The denominator was due to Einstein’s concept of the Relativity of Simultaneity (Miller, p. 286), which we demonstrated in Chapters 26 and 28 is ad hoc and empirically invalid. Einstein’s above conclusion has been explained by many of his followers, as follows. If we make the analogy that light from a distant star is like a rain of photons, then the direction of such rain will change relative to an astronomer/observer on Earth arbitrarily moving at v in its solar orbit relative to such rain. Therefore, the change in the relative direction of such rain of photons can be calculated to the first order of approximation from such relativistic formula (French, pp. 132 – 134; Zhang, p. 153; Hoffmann, 1983, pp. 47 – 48). The implications from the above conjectures are that Einstein’s relativistic aberration formula predicts and approximates Bradley’s 1728 aberration of starlight experiment (which was determined empirically), and therefore Bradley’s work was an experimental confirmation of Special Relativity (Miller, p. 286). On the contrary, Bradley’s 1728 aberration of starlight had two components: 1) the telescope had to be tilted to a certain angle, vis. 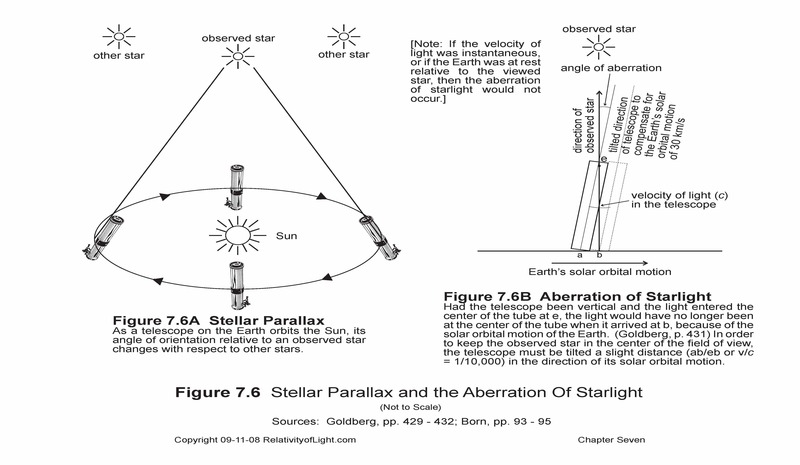 the constant angle of aberration, in order to keep the star in the center of the scope, and 2) as a result the direction of the starlight relative to the Sun appeared to constantly change during the Earth’s annual solar orbit (Chapter 7D and Figure 7.6). Einstein’s relativistic formula only described the latter. Einstein’s relativistic formula cannot even be applied until the constant angle of aberration ‘a’ and the velocity v of the receiver (i.e. the Earth) have been empirically determined. Also, the mere mathematical approximation and description of an age-old empirical discovery is obviously not a prediction of what happened in the past. In any event, Bradley’s work in 1728 is not an experimental confirmation of Special Relativity in general or of the empirical validity of the ad hoc Lorentz transformation in particular. The only assertion of Special Relativity that Bradley’s experiment did confirm was the second part of Einstein’s second postulate: that the velocity of light is independent of the motion (velocity) of its source body. However, as we have repeatedly pointed out, this assertion was never in doubt by 1905. For all of the above reasons, Einstein’s ad hoc relativistic formula for stellar aberration is ad hoc, empirically invalid and above all meaningless. In 1906, Johannes Stark (the publisher of Einstein’s December 1907 Jahrbuch article) observed a shift in the periodic spectral lines of high velocity hydrogen canal rays (particles) emitted substantially perpendicular to the observer, which he interpreted to be a Doppler shift. The observed frequency of such spectral lines (v) was apparently less than the emitted frequency (v0) (Zhang, p. 183; Einstein, 1907 [Collected Papers, Vol. 2, p. 263]). In early 1907, Einstein interpreted the canal ray ions that produced such periodic spectra to be “a fast moving clock.” He also claimed that such theoretical transverse Doppler effect could be predicted from his concept of “Time Dilation”: “a uniformly moving clock runs at a slower rate as judged from a “stationary” system…” (Ibid, p. 232). Note that Einstein was using one ad hoc concept (Time Dilation) as the foundation and justification for another ad hoc concept (the transverse Doppler effect). Circular reasoning? (Ibid, pp. 266 – 267). “[W]e see a given number of oscillations in a time that is longer than the proper time. Or, equivalently, we see a smaller number of oscillations in our unit time than is seen in the unit time of the proper frame. Therefore, we observe a lower frequency than the proper frequency” (Resnick, 1968, p. 91). In other words, the distant stationary observer S theoretically measures a longer (dilated) time period between less frequently received longer light waves than the observer S′ moving with the particle properly measures during a proper time interval (Resnick, 1992, p. 898). “Thus any confirmation of the transverse Doppler effect can therefore be taken as another confirmation of relativistic time dilation” (Ibid; Bohm, p. 80). Again, we have one unobservable ad hoc relativistic effect confirming another unobservable ad hoc relativistic effect, but we know that Time Dilation does not empirically exist (Chapters 26 and 28). In 1937, Ives and Stillwell conducted a canal ray (accelerated positive ions) experiment based on the existence of ether which the relativists claimed confirmed Einstein’s transverse Doppler effect; whereas, Ives himself claimed that the results instead verified a different theory (Miller, p. 212). Here we have the relativists claiming that an experiment confirms one of their concepts, and the person who devised and conducted the experiment denying such confirmation. Gill concluded that: “Evidence for the correctness of the [Doppler] formulae to the second order in vc [the transverse Doppler effect] depends on specially designed experiments which are few in number and not high in precision” (Gill, p. 140). Miller concluded that, with his theoretical transverse Doppler effect, Einstein went far beyond his intent in 1905, and in 1907 he defined a clock as “any periodic process—for example, an atomic oscillator emitting a frequency…” (Ibid). Miller was correct. Einstein’s interpretations and applications that accompanied his transverse Doppler effect opened a Pandora’s Box of similar ad hoc interpretations and applications for his relativistic concepts. For example, if any periodic process (in nature or otherwise) could be interpreted to be a clock, and if any such moving clock could be interpreted to be slowing down, then the concepts of Time Dilation in particular, and Special Relativity in general, could be expanded to other phenomena without any restraints or limitations. This is exactly what happened with the quantum mechanics explanation of why fast moving theoretical atomic particles (pions and muons) are believed to decay slower than expected on their way toward Earth. It was, of course, because of Time Dilation (Chapter 37). Einstein also felt free to use such expanded interpretations and ad hoc applications of Special Relativity to help concoct his General Theory of Relativity (Einstein, Relativity, pp. 88 – 91), even though General Relativity contradicts Special Relativity (Chapter 40). Regardless of dubious interpretations and claimed experimental confirmations, we know that Stark’s 1906 observations and Ives’ 1937 results were not the result of relativistic Time Dilation or any relativistic transverse Doppler effect. Why? Because in Chapters 26 and 28 we demonstrated that the Relativity of Simultaneity and Time Dilation were ad hoc and empirically invalid. Also, in Chapter 27 we demonstrated that the Lorentz transformations (which mathematically produced the theoretical consequence of Time Dilation) were also ad hoc, empirically invalid and meaningless. Without these foundational concepts to support it, or as its premise, no transverse Doppler effect can even theoretically exist. The conclusion is clear: Einstein’s unobservable relativistic transverse Doppler effect is just another mathematical fantasy. 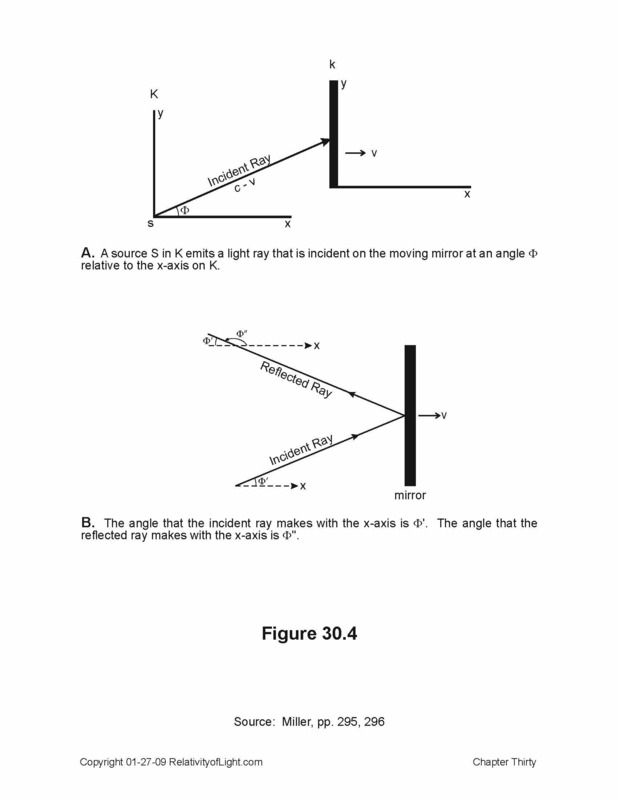 E. The energy and pressure of light on an inertially moving mirror. In early 1904, Abraham published a widely read paper entitled, “On the Theory of Radiation and of the Pressure of Radiation.” In it Abraham “deduced equations…for the characteristics of radiation reflected from a perfectly reflecting surface in inertial motion relative to the ether, and for the light pressure on this surface…” (Miller, p. 298). In his 40-page paper, “Abraham discussed all of his results in great detail” (Ibid, pp. 291, 300). Very importantly, in order “To obtain exact results… he used only one reference system, fixed in the ether” (Ibid, p. 298). “It is remarkable that the energy and the frequency of a light complex vary with the state of motion of the observer in accordance with the same law” (Ibid). On the contrary, the energy and the frequency of a propagating light ray generally do not vary in accordance with the same law. The energy of an emitted light wave normally does not vary as it propagates through the vacuum of empty space from a star to Earth. However, if it encounters particles of matter during its journey it could convert a fraction of its energy to heat during the process of absorption and re-emission. After a great number of such encounters the diminished energy level of the light ray may be manifested by a red shift observed on Earth. On the other hand, the observed frequency of a propagating light wave a priori can vary depending upon the linear motion of the observer. If the observer moves toward the linearly propagating light ray, a priori the frequency of its waves will appear to increase, and this will be manifested by an observed blue shift. Conversely, if the observer moves away from the linearly propagating light ray, a priori the frequency of its waves will appear to decrease, and this will be manifested by an observed red shift (the Doppler effect of light). In these situations, the energy of the light wave which is received by the linearly moving observer may increase or decrease, but the energy possessed by the light wave itself does not physically change; the energy possessed by the light wave (whatever it may be) remains constant as it propagates, regardless of any relative motion by the observer (its potential recipient). Thus, the law that governs the change in energy of a light ray is very different than the law that governs its observed frequency. “What is essential is, that the electric and magnetic force of the light which is influenced by a moving body, be transformed into a system of co-ordinates at rest relatively to the body. By this means all problems in the optics of moving bodies will be reduced to a series of problems in the optics of stationary bodies” (Ibid). Miller asserted that Einstein’s results in Section 8 were equivalent to Abraham’s results in his early 1904 paper (Miller, p. 298). But how could this be? Abraham theoretically measured his light rays relative to the stationary ether, whereas Einstein applied relativistic equations to his light rays and denied the existence of ether. It turns out that both Abraham and Einstein applied their light rays to a system theoretically at rest. Abraham’s system at rest was the hypothetical ether that does not exist. Einstein’s system at rest was his axiomatic velocity of light at exactly c in every inertial system regardless of its linear motion. Thus, light propagated at c from K is theoretically received at the mirror in k at c “as if the surface were at rest” (Miller, p. 300). And Einstein’s relativistic transformation equations make this virtual result mathematically so. Actually, and empirically, as we learned in Chapter 21, the light propagating from K at velocity c relative to the medium of the intervening space also propagates toward the mirror at k(moving away from K) at c – v (Figure 30.4A). Therefore, neither Abraham’s impossible ether solution nor Einstein’s impossible absolutely constant velocity of light at c explanation is correct or equivalent. Most likely, both were completely ad hoc, arbitrary and meaningless. F. The invariance of an electrical charge. In Section 9 of his Special Theory, Einstein first attempted to demonstrate the invariance of the Maxwell-Hertz equations in the presence of an electric charge (Einstein, 1905d [Dover, 1952, pp. 59 – 60]). Einstein assumed that electric charges are coupled to electrons, and therefore that the Maxwell-Hertz equations “are the electromagnetic basis of the Lorentzian electrodynamics and optics [theory] of moving bodies” (Ibid, p. 60). He also assumed that the Maxwell-Hertz equations were valid in the stationary system K (Ibid). Einstein then transformed the Maxwell-Hertz equations to system k with the Lorentz transformations (with the assistance of the electromagnetic field transformation equations that he used in Section 6), but this was still insufficient to achieve his desired covariance. Einstein found that this time he also had to use an additional transformation equation for the charge density in order to achieve covariance (Miller, p. 306). After this convoluted transformation process, Einstein concluded that “the electrodynamic foundation of Lorentz’s theory of the electrodynamics of moving bodies is in agreement with the principle of relativity” (Einstein, 1905d, [Dover, 1952, p. 60]). “If an electrically charged body is in motion anywhere in space without altering its charge when regarded from a system of co-ordinates moving with the body, its charge also remains—when regarded from the ‘stationary’ system K—constant” (Einstein, 1905d [Dover, 1952, p. 61]). But how could such electric charge remain the same if it was contracted and its time was dilated by all of such relativistic transformations? It turns out that Poincaré had developed an identical mathematical proof of the invariance of an electrical charge in early 1905, but it assumed a stationary ether (Miller, p. 307). Intuition, logic and classical physics would also produce the same result without any transformations. If all inertial frames are equivalent states of motion, why should an electric charge vary from one inertial frame to another? There is no viable physical reason. This conclusion should also apply to all other physical phenomena (including length, time, mass, etc.) as it did in classical physics. The conclusion is clear: No physical phenomenon is velocity dependent, with the possible exception that the constant velocity of light at c relative to the vacuum of empty space is also c ± v relative to linearly moving bodies. Why did Einstein want to demonstrate the mathematical invariance of an electric charge? One reason probably was because Kaufmann assumed the invariance of electric charge for his experiments about electromagnetic mass in 1901 – 1902, and Einstein used Kaufmann’s experiments and his concept of electromagnetic mass as the foundation for his own concept of Relativistic Mass in Section 10 of his Special Theory. It would be natural for Einstein to want to bolster Kaufmann’s critical assumption which Einstein needed to adopt for his Special Theory (Chapter 31A).